Gary Maddock is technical manager, Zapp Tooling Alloys, Summerville, SC: tel. 779/537-0870; www.zapp.com. The optimization of tooling performance helps metalformers eliminate waste and improve operations. This requires giving proper consideration to the selection and treatment of the tool steel. Users of tool steels are confronted with a range of options relative to heat treatment methods, coatings and other special treatments intended to improve tool performance. Rather than rehash such information, the intent here is to suggest how tooling engineers and designers can take a fresh approach to tool steel from the perspective of lean manufacturing. The first step: Identify an appropriate goal with respect to tooling performance. While it might seem desirable for tooling to last forever, this would not be realistic nor would the high costs required necessarily translate into value at the bottom line. From a lean perspective, tooling should perform reliably, consistently and predictably. This allows a metalformer to effectively plan its operations, reduce variation and improve process flow. Select the correct grade that offers the appropriate balance of wear and toughness for the job at hand. The tool steel often takes the blame for problems that originate elsewhere, such as in the design, manufacture or maintenance of the tooling. From the start, metalformers must ensure that they are not asking more of the tooling that what it can handle—a classic source of waste. Start by selecting the right grade of tool steel as part of the design process, and by specifying the heat treatment of the tool steel as part of the tool-manufacturing process. 1) Select the correct grade that offers the appropriate balance of wear and toughness for the job at hand. Tool-steel suppliers can provide data comparing properties on a relative scale. Wear resistance generally is associated with longevity —it enables the production of more parts, extends maintenance intervals and minimizes downtime. To some extent, wear life may not seem as much of a concern in the age of JIT, short production cycles and more frequent tooling changes. However, achieving adequate wear resistance still is key to producing good parts with minimal variation, and to keeping dies out of the toolroom. Simply using a more wear-resistant grade may not als be the correct choice. Do not overlook the importance of toughness; nothing spoils reliability and creates waste more quickly than a die component that develops the bad habit of suddenly chipping out a cutting edge (even though it otherwise performs to expectation). And, it is important to have a consistent selection methodology. Using a different grade of tool steel for each job likely will not allow metalformers to enjoy predictable performance. 2) Heat treat correctly. The effort required to correctly heat treat tool-steel components is significant in terms of time and money. However, no other single step will have greater impact on how the tooling will perform. Stampers must follow the proper procedure —without shortcuts—to realize the full capability of a particular grade of tool steel. A tool that has been poorly heat treated might work some of the time, but eventually the result will be inconsistent performance and waste. 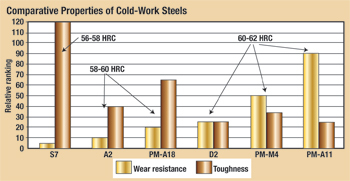 This is even more evident when using high-alloy, high-performance tool steels that can tend to be much less forgiving. As a side note, manufacturers of heat treating equipment have made significant advances in recent years, such as high-pressure quench vacuum furnaces. Metalformers should seek opportunities to leverage those improvements. 3) Avoid inflicting unintentional damage. Work to maintain control of surface integrity when finishing the tooling. For example, overly aggressive grinding or EDM machining can cause poor edge retention, premature wear and an apparent loss of toughness. Care taken during finishing operations to minimize surface damage, remove burrs and maintain good edge quality will provide real value in the end. The more demanding the application, the more critical these considerations become. 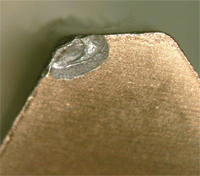 Overly aggressive grinding or EDM machining can cause poor edge retention (shown here), premature wear and an apparent loss of toughness. Care taken during finishing operations to minimize surface damage, remove burrs and maintain good edge quality will provide real value in the end. Take a disciplined approach, whether attempting to improve tool performance or actually dealing with a tool failure. The challenge is to accurately determine the primary constraint or root cause of the failure. If at all possible, routinely examine tooling while in service to gain a clear understanding of how wear develops. By the time the die gets back to the toolroom, it might not be possible to determine how the problem initiated, particularly if a catastrophic failure resulted. Metalformers also should keep accurate and timely records concerning the specific identity of the tool-steel items used. Having assembled all of the available facts related to a performance issue or tool failure, begin to untangle the cause-and-effect relationships that underlie the problem. Consider all of the factors that possibly could play a role, beginning with the design of the tooling through to its actual handling and maintenance in service. The metalformer may need to perform several iterations of lean problem-solving methodology to obtain the desired level of improvement. An actual metallurgical-lab analysis may be indicated to provide confirmation of any suspected issues related to tool-steel quality, heat treatment or surface damage. If these issues can be ruled out, the stamper can take positive steps to upgrade tool performance by using more advanced tooling materials, surface coatings or treatments to enhance wear performance. Although the common air-hardening grades such as S7, A2, D2 and M2 remain the workhorse tool and die materials, these materials have become commodities and quite generic in nature. The use of larger ingot and heat sizes along with the implementation of other cost-driven measures has negatively affected product uniformity and overall quality. This trend has given rise to the development of a number of proprietary premium tool-steel grades intended to improve performance in demanding applications. Manufacturers produce premium tool steels using special melt methods and special compositions, resulting in improved metallurgical microstructures and correspondingly enhanced properties. Example: The powder-metallurgy (PM)-produced grades, characterized by very uniform and fine grain structure free from the alloy segregation effects inherent in any conventional ingot cast material. Highly alloyed PM grades offer levels of wear resistance previously unattainable, but there also are lower alloy grades that offer good wear resistance along with excellent toughness. • Highly complex dies and tooling. In addition to upgrading tool materials, tooling engineers can select among numerous options for coatings and surface treatments, which can improve tool performance. Examples include PVD thin-film coatings, which have evolved recently to include a variety of processes and coating compositions. One note: Take care to ensure that the substrate material is suitable for the coating process selected. See also: Zapp Tooling Alloys, Inc.